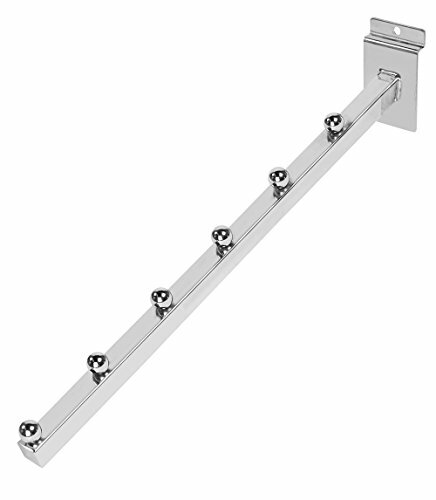 The Self Adhesive Medium Duty Delta Slot Hang Tab can be Attached To Various Surfaces so that Merchandise Is Well Organized And Efficiently Exhibited In Retail Store Hooks. All Our Hang Tabs Are Made Of Clear U.V. Inhibited Plastic, With Ultra Bond Adhesive. This Hang Tabs are available in Sheets for Faster Peeling. 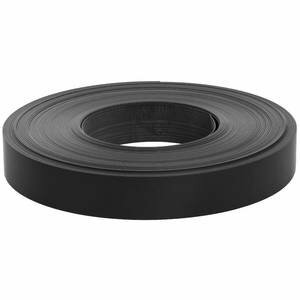 Search Through Our Catalog And Identify The Best Hang Tab That Will Suit Your Needs. Material: Clear U.V. inhibited plastic / Thickness: 14 mil (Gauge 356) / Tabs per sheet: 10 tabs. It is as easy as 1, 2, 3....Peel off the adhesive, apply it to the merchandise package and exhibit your product in the hook in an elegant manner. The unique format of our Hang Tabs makes them faster to peel and use by your store employees. 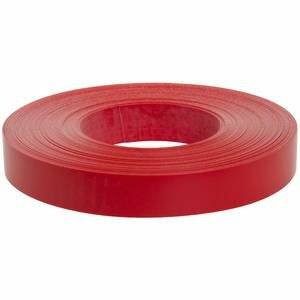 All Adhesives Are Standard High Performance, Silicone Resistant and can be Applied At Low Temperatures. This is a set of three Chrome Square Tube 6 Ball Waterfalls for use with Slatwall. Use these to hang just about anything from clothing to all types of merchandise. Smart retailers use this item to maximize and organize available display space making products more visible to customers to simplify the shopping experience. 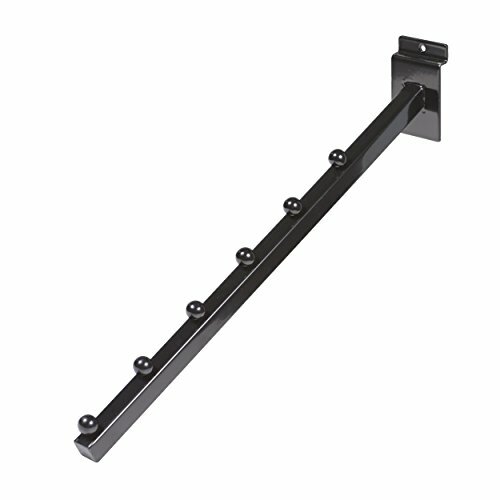 Increase the amount have space you have to display your products to your customers by purchasing these Slatwall Shelf Brackets. 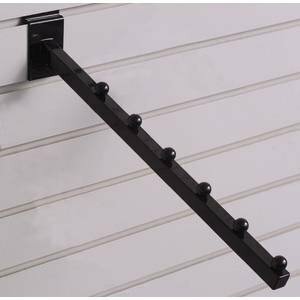 These brackets are great for supporting shelves and planks that you can show off your merchandise on. Plus, they look fantastic. Thy come with a stunning black finish that will keep your customers interested. These custom hang tags will sell merchandise. The tabs have an adhesive that sticks to the back of item. 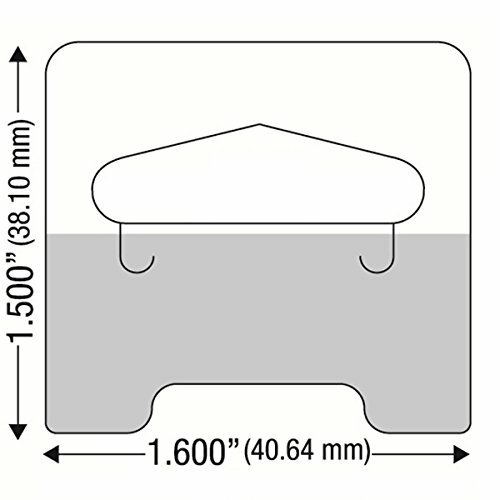 These custom hang tags are ideal for hanging light and medium-weight carded products. The tab will work with all display hooks and saves space. These custom hanging tags make merchandise appeal to sell. This is a Black Square Tube 6 Ball Waterfall for use with Slatwall. Use to hang just about anything from clothing to all types of merchandise. Smart retailers use this item to maximize and organize available display space making products more visible to customers to maximize and simplify the shopping experience. Waterfall Square Tube 5 Hook for Gridwall (j-hooks) are great for hanging and promoting items like purses, handbags, and scarves. They work especially well with any item that hangs from a strap or displays well on a hook. These easily attach to standard 3 inch gridwall panels and will instantly increase your retail display area in a neat and orderly fashion providing an enhanced visual appeal to your customers. This cup measures 4" L x 6" H x 4" D and is transparent. 1 cup is included in this order. 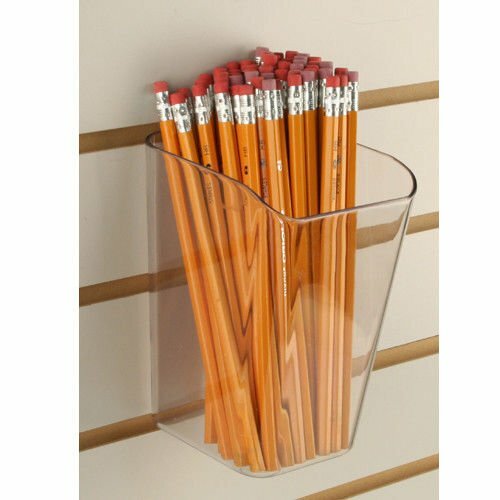 Insert this clear acrylic cup bin into your slatwall to display small and bulk items. 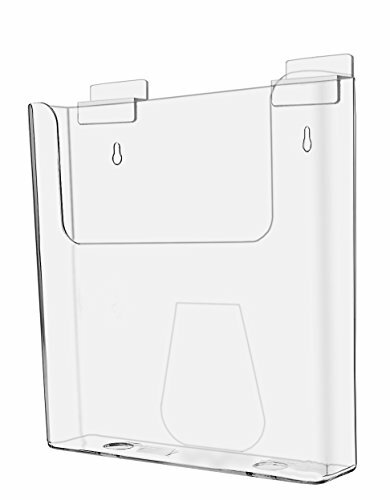 Our slatwall cup bin is made out of a clear acrylic plastic and has an angled opening for easy access. 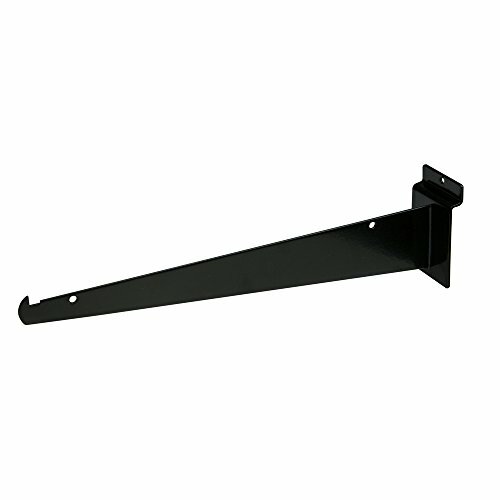 This item also will fit on 1/4 pegboard displays and will hold up to 5 pounds of merchandise. 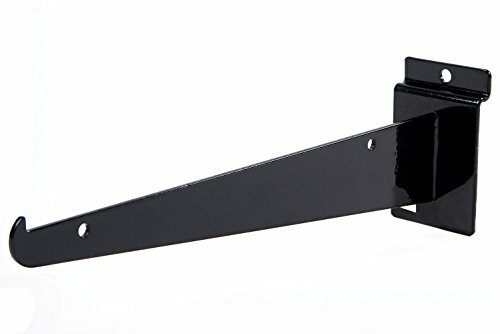 Straight bracket with lip. Accepts shelf rests and bumpers for glass shelves. Works for Duron & trade; injection-molded shelves as well as wood and melamine. Slatwall Greeting Card Holder, Closed Ends, 11 3/4"
The slatwall card holder is 11 3/4" in length and has closed ends. 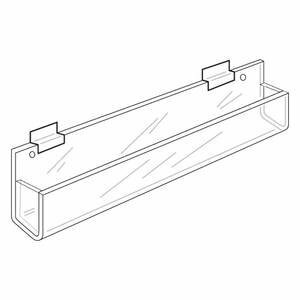 This shelf is made up of durable clear acrylic material. 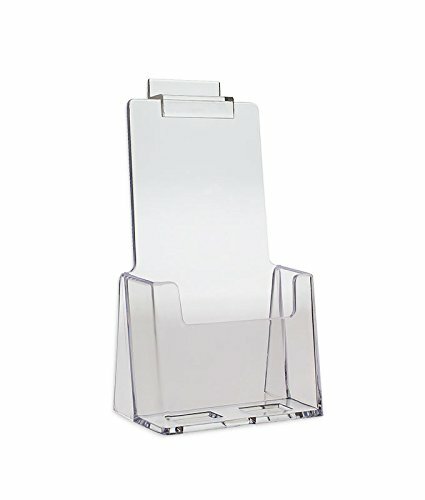 The slatwall card holder works well with showcasing videos, cd's, and much more. This clear bin is easy to install by sliding tabs into the panel grooves. The slatwall card holder has a front lip which keeps cards upright and in place. The vinyl accent strips will freshen up your slatwall display and give your retail space a fresh new appearance. The vinyl inserts are easy to install and can be inserted before or after the slatwall has been installed on the wall. They simply slide into the slatwall grooves. They are made of vinyl which is easy to cut to any length. The strips come in multiple colors and can easily be changed throughout the year to coordinate with the seasons and the holidays to give the retail space a fresh new inexpensive update. 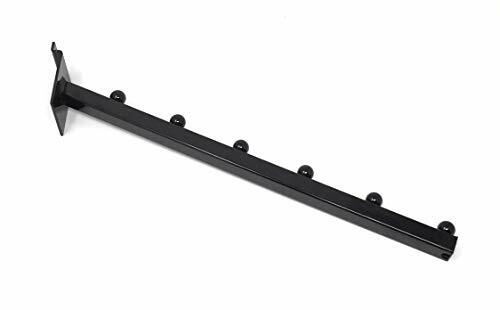 This is a 6 Ball Waterfall Slatwall Hook with Square Tubing 16 Inches Long Used to hang just about anything from clothing to all types of merchandise. Smart retailers use this item to maximize and organize available display space making products more visible to customers to maximize the space and simplify the shopping experience. The waterfall racks have a chrome finish. Each holder is 1/2" x 1 1/2" tubing. The waterfall racks extend retail space. Each holder showcases an array of products. The waterfall racks have a convenient downward angle. This shelf with lip is great for highlighting merchandise that is on sale. The j-rack features a front lip to keep items in place. 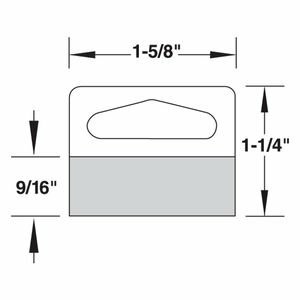 This shelf with lip measurements are 23 3/4" x 5 1/4" (W x D). 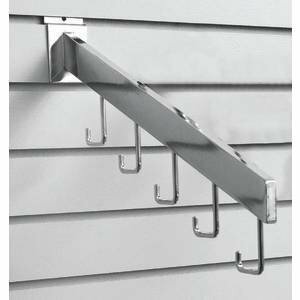 The j-rack has easy to use hooks that slide into the grooves of the slatwall, requiring no tools. 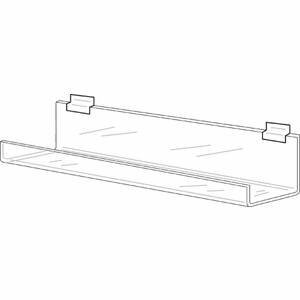 This shelf with lip is a clear acrylic material that makes it easy for customers to view the products. Display all of your hanging products on this 6-Ball Slatwall Faceout. This Chrome 6-Ball Waterfall Faceout is designed for use on Slatwall and slat grid. The chrome finish looks great on any Slatwall surface and is a great addition to any setting. 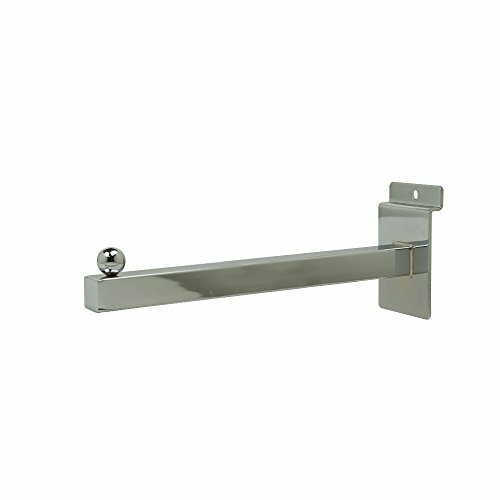 This Waterfall Faceout is perfect for displaying various kinds of clothes, tops, jackets or other hanging merchandise. It's easy to assemble and install, as well as to rearrange, so your display is set to your liking. Attract customers without distracting them from the merchandise that's on display with this Chrome Waterfall faceout! These vinyl accent strips will freshen up your slatwall display and give your retail space a fresh new appearance. They are durable and are easy to install. They can be inserted before or after the slatwall has been installed on the wall. They simply slide into the slatwall grooves. They are made of vinyl which is easy to cut to any length. The strips come in multiple colors and can easily be changed throughout the year to coordinate with the seasons and the holidays to give your retail space a fresh new inexpensive update.